What Day Of The Week Is August 28? 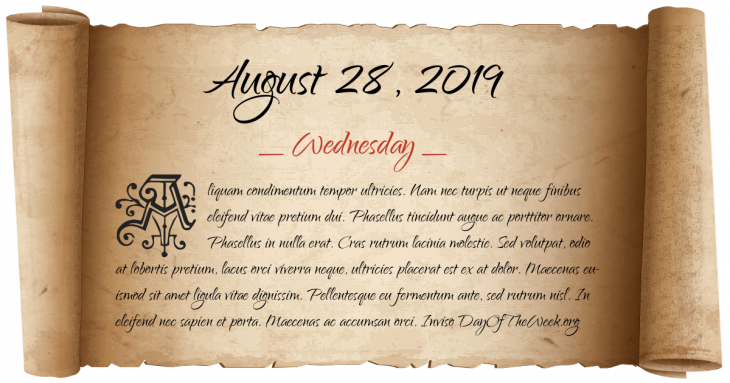 August 28, 2019 is the 240th day of the year 2019 in the Gregorian calendar. There are 125 days remaining until the end of the year. The day of the week is Wednesday. Turkish-Portuguese War (1538-1557) – Battle of Wofla: the Portuguese are scattered, their leader Christovão da Gama is captured and later executed. The Slavery Abolition Act 1833 receives Royal Assent, abolishing slavery through most the British Empire. American Civil War: Second Battle of Bull Run, also known as the Battle of Second Manassas. World War I: Germany declares war on Romania. Ramstein airshow disaster: three aircraft of the Frecce Tricolori demonstration team collide and the wreckage falls into the crowd. 75 are killed and 346 seriously injured. Pakistan’s National Assembly passes a constitutional amendment to make the “Qur'an and Sunnah” the “supreme law” but the bill is defeated in the Senate. Who were born on August 28?